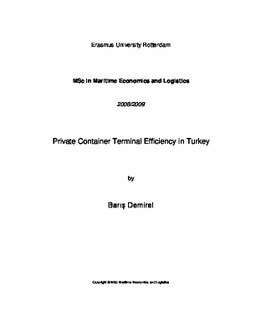 The main objective of this paper is to investigate the possible impact of private sector involvement in container terminal operations on port (terminal) efficiency in Turkey in a regional perspective. The analysis of efficiency of the container terminals has included the most important container terminals in Turkey and in the Eastern Mediterranean region. The efficiency evaluations have been performed applying a non-parametric approach called Data Envelopment Analysis (DEA), and the impact of the private sector involvement in container terminals has been assessed applying a Tobit regression model, with the inputs of DEA scores as independent variable, and some other possible factors which may influence the efficiency in port sector. Apart from private sector involvement, scale (throughput), hub or gateway function, nautical distance from trunk route, and efficiency and effectiveness of customs and other border procedures at country level have been set as the possible factors influencing the technical efficiency scores in the Tobit regression model. It has been found that the private sector involvement in container terminals is one of the statistically significant factors together with scale (throughput), so there is sufficient evidence at least not to reject the hypotheses that private sector involvement in the operation of container terminals and scale effect are associated with higher efficiency. It has also been found that private terminals in Turkey are almost 22 and 17 percent more efficient on average than public container terminals under CCR and BCC models, respectively. The hub status of the terminals, the nautical distance from East West route, and the efficiency and effectiveness of customs and other border procedures have been found statistically insignificant.